While driving home this afternoon just west of Barrie, Ontario, I spotted a large bird in flight. Upon taking a closer look I saw the "white head" and just about drove off the road when I realized exactly what kind of bird I was looking at. Thanks Lori, for telling us about your Bald Eagle sighting! 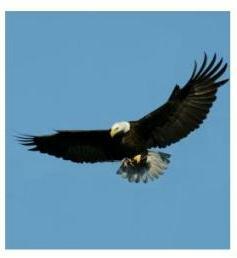 I hope you like the picture of a Bald Eagle we found. December 14 2013 - Three Bald Eagles on north shore Kempenfelt Bay (Lake Simcoe, near Barrie, Ontario). Two roaming adults and what seemed like a juvenile bird who just sat in the tree for about 5 hours. Just spotted a large adult Bald Eagle at Highway 400 & McKay in Barrie, driving home from cottage. It was incredible!